Car parking available adjacent to allotments on North Road. Ivel Springs is a large Nature Reserve in Baldock. The springs, which are the source of the River Ivel, provide a diverse area for wildlife including woodland, wetland and pasture. 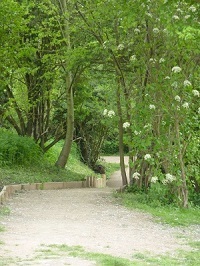 The site was used as a household rubbish dump until the 1950s when it reverted to rough woodland. Now it is carefully managed to keep a mixed habitat and encourage wildlife to flourish. If you want to find out how you can get involved in keeping this natural habitat special visit the Countryside Management Service website or contact the Friends of Baldock Green Spaces.